Rep. Oliver Robinson (D-District 58, Jefferson) delivered the keynote address at the book event for Let Me Tell You About Me on the Department of Youth Services Vacca Campus on November 3. Robinson, an NBA veteran, encouraged the student writers with stories from his youth. “About fifteen percent of my life has been real good,” said Robinson. “The rest of it has been pretty difficult. But it didn’t matter that most of the time our mother raised us alone. It didn’t matter that I grew up in the Gate City housing project. I knew deep inside that I was going to be a special person. Robinson, who played for the San Antonio Spurs and was the first student athlete awarded a scholarship at the University of Alabama at Birmingham (UAB), further emphasized his commonality with the students. 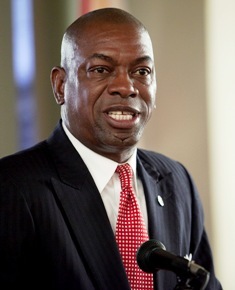 Elected to the Alabama House of Representatives in 1998, Robinson received his BS in Urban Affairs from UAB. He is a member of the Bethel Baptist Church in Birmingham, Phi Beta Sigma, and the Birmingham Public Park and Recreation Board. He was also distinguished as the Birmingham Business Journal's Top 40, Under 40 in 1996. One newly published writer read his poems from Let Me Tell You About Me. Seven members of the new class read their favorite poems from the anthology and samples of their new work. Like licking Kool-aid powder off your hands. Like a free rib buffet. Like the battle of the bands. Like a boxer throwing punches. Like picking a bingo ball. Every five seconds somebody falls. Moving from corner to corner. When they come everybody hides. Like throwing a fish net. To me, it’s just another day in the projects. I ask myself, why me? Why didn’t I go to school? Why didn’t I go to court? Why did I disobey the law? Why did I lie to my father? Why did I have a gun? Why did I rob that person?